If you need service, we can provide emergency services at any time, day or night.Whatever Storm damage you have experienced, we are fully equipped to help. Before Your old tree fell on your vehicle and damage it , we are here to help when Mother Nature strikes. We provide 24/7 assistance to get your repair processed when storms hit. Storms can cause serious damage to trees and fallen or significantly damaged trees may threaten your property and your safety. Damaged trees require professional assessment and may need to be removed by experienced arborists to ensure the safety of your residential home or commercial enterprise.Our trained and qualified work crews have many years of experience with assessing and promptly removing damaged or hazardous trees that pose a threat to you and your property. 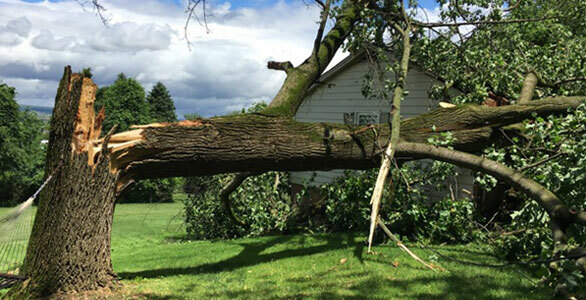 Using state-of-the-art equipment and specialized machinery, our experienced staff is always available for emergency tree removal and damage assessment.